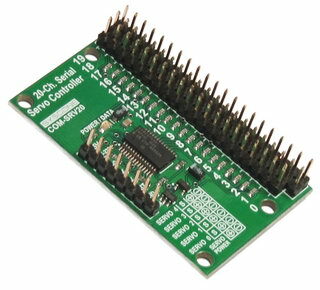 The COM-SRV20 servo controller is a very compact solution for controlling up to 20 radio control (RC) servos from a computer or microcontroller. The controller measures just 2.1in x 1.3in, it incorporates a 5V servo powered voltage regulator (no need for external power supply, it can provide up to 150mA power for an external microprocessor), and yet it is one of the most robust servo controllers available. Each servo range can be controlled independently, including any standard RC servos or the giant 1/4-scale servos.